Regulators are suing the Southern California Gas Co., claiming negligence and seeking civil penalties against the utility in connection with a natural gas leak that has been spewing methane in Porter Ranch, California, since late October. The complaint, filed by the South Coast Air Quality Management District in Los Angeles Superior Court, seeks up to $250,000 for each alleged violation of the state Health and Safety Code cited in the lawsuit. Since the leak began, the district has received more than 2,000 complaints of odors from people living or working near the Aliso Canyon facility, the suit states. In addition, thousands of people living near the facility have temporarily relocated, two local schools have closed and thousands of students have been relocated for the rest of the school year. According to the suit, the regulatory authority issued a notice to SoCalGas on Nov. 23 for causing "an ongoing public nuisance... due to odors from the natural gas leak." 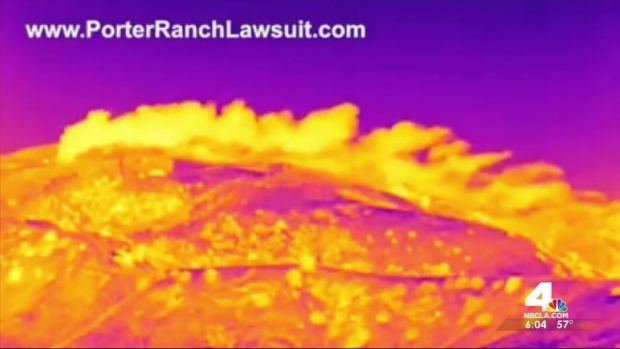 Regulators sue SoCalGas for negligence over the monthslong Porter Ranch gas leak. Robert Kovacik reports for the NBC4 News at 11 on Tuesday, Jan. 26, 2016. The suit also claims "SoCalGas knew of the emission and… failed to take corrective action within a reasonable period of time." Sam Atwood of AQMD told NBC4 general counsel should address the situation Wednesday. "The next step is for the AQMD to put their money where their mouth is, to prove that the utility knew darn well that there was a problem here, they looked the other way, and they put lots of lives at risk. 2000 people are complaining. Now, they've got the power of the government behind them," said NBC4 legal analyst Royal Oakes. Assemblyman Mike Gatto said it could be a game-changer. "This changes the dynamic because it indicates that finally the regulators are getting serious about the problem," Gatto said. "Getting the regulators to take action was one of the goals of our hearing last week. I'm pleased they're moving in the right direction, but the priority remains getting SoCalGas to plug the leak." SoCalGas did not immediately respond to NBC4 for comment.